WASHINGTON — The Senate Judiciary Committee is asking for new records from two current and former White House officials as part of its investigation into Russian meddling in the 2016 election. 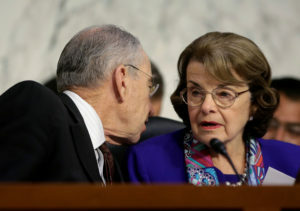 Senate Judiciary Chairman Chuck Grassley and the top Democrat on the committee, California Sen. Dianne Feinstein, wrote a letter to a lawyer for President Donald Trump’s campaign on Thursday and asked for additional email records pertaining to former campaign officials Rick Dearborn and John Mashburn. The committee last year requested similar records from several other Trump associates and aides. Dearborn and Mashburn were in charge of policy at one point in Trump’s campaign, and both followed him to the White House. Dearborn left earlier this year, while Mashburn is currently deputy cabinet secretary, an official who coordinates communications between the White House and the president’s Cabinet. The Judiciary panel is one of several committees investigating the meddling, and committee staff members have conducted interviews behind closed doors in recent months. Grassley and Feinstein did not describe the interview that prompted the request and a spokesman for the committee wouldn’t elaborate. Feinstein had previously written letters alone to lawyers for both men, asking for more information about their knowledge about Russian contacts with the Trump campaign. Dearborn is a former aide to Attorney General Jeff Sessions, serving as his chief of staff when he was an Alabama senator. In her Dec. 4 letter, Feinstein asked Dearborn about reports that a senior Russian official with ties to Russian President Vladimir Putin had requested that Dearborn set up a meeting between Trump and Putin. In a Jan. 25 letter to Mashburn, she asked about his interaction with other campaign officials such as Dearborn who had had contact with Russians. The Trump campaign has already provided more than 28,000 pages of documents to the Judiciary panel, according to Grassley and Feinstein’s letter. That includes a list of 21 campaign officials whose emails were searched.